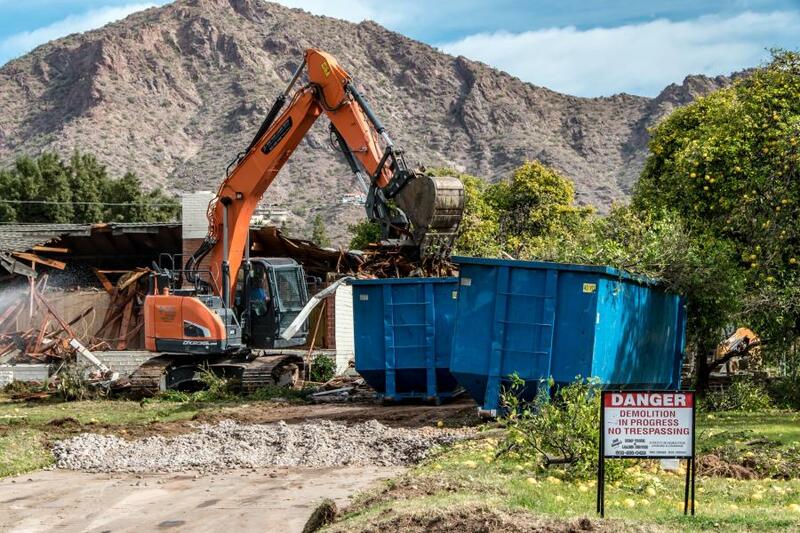 Residential construction in Phoenix, Ariz., is going so strong that developers are paying contractors to demolish existing homes and make space for newer, bigger and more expensive homes. This is especially true in Arcadia, an affluent area of Phoenix and Scottsdale, where citrus farmers previously grew oranges, lemons and grapefruits. The median home value in the area is above $500,000, and home values have gone up 12 percent in the past year. 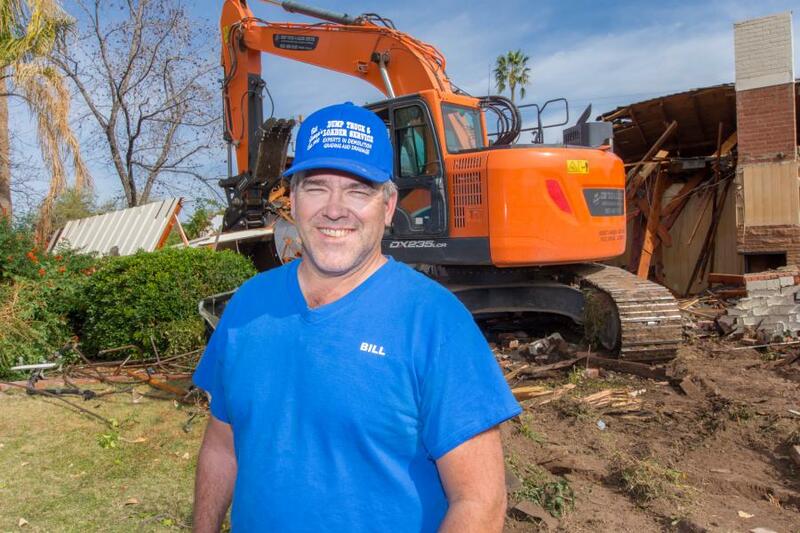 Demolition specialist Bill George has carved a successful niche for himself, working with a select group of developers to demolish structures and grade lots for new homes. George, now in his 40s, got an early start operating heavy equipment and loading and transporting materials when he was still in high school. Shortly after high school, he started his own company — Bill George's Dump Truck and Loader Service — and his business quickly took off, due in part, to advertisements in the local newspaper. “I liked trucks and tractors and I decided I was going to buy a five-yard dump truck and skid-steer loader, and start a little business,” George said. But in May 2006, tragedy struck — George was hit and run over by a passing truck. The damage was significant. The accident caused fractures in his neck and back, and he was forced to sell his company. Life was difficult. He lost the use of his right hand and was not able to operate equipment. Seven years later, in December 2013, George started his comeback. He got himself back in good physical shape and he restarted his business. Having been out of business and without heavy-duty equipment, George and his father tackled their first project since the accident, operating just his skid-steer loader and a dump truck. George did just that. He bought an old excavator, described as “worn out,” but it got him started on the right path. 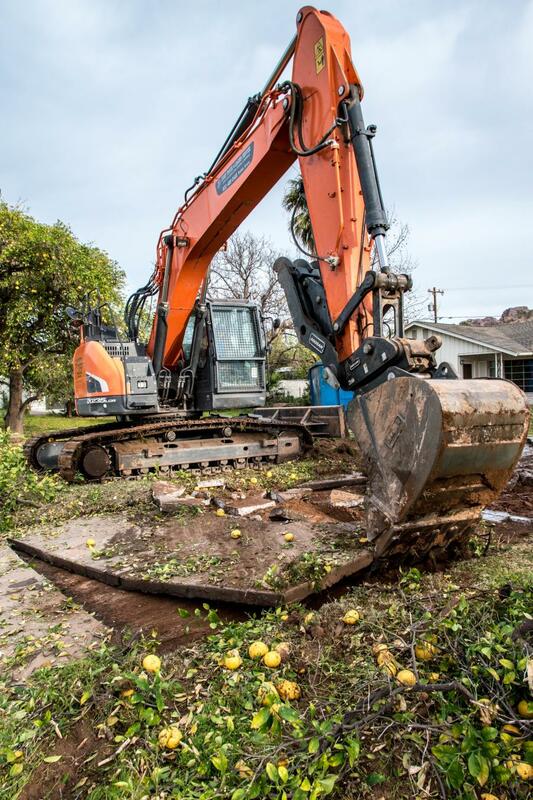 As soon as he bought the excavator, he shared a picture of it with a contractor and the contractor sent him four or five addresses where he could demolish the homes. Today, George positions his company as “experts in demolition,” as well as grading and drainage. As George was rebuilding his business, his biggest headache was with his older, worn-out excavator. He said it was always breaking down. That is when he met Pat Gallagher from the local Doosan equipment dealership in Phoenix. It took some time for George to decide on the Doosan brand. Gallagher was persistent yet gave him the time he needed to make the decision to switch to Doosan. George said he really struggled with not buying his previous brand of construction equipment over Doosan. 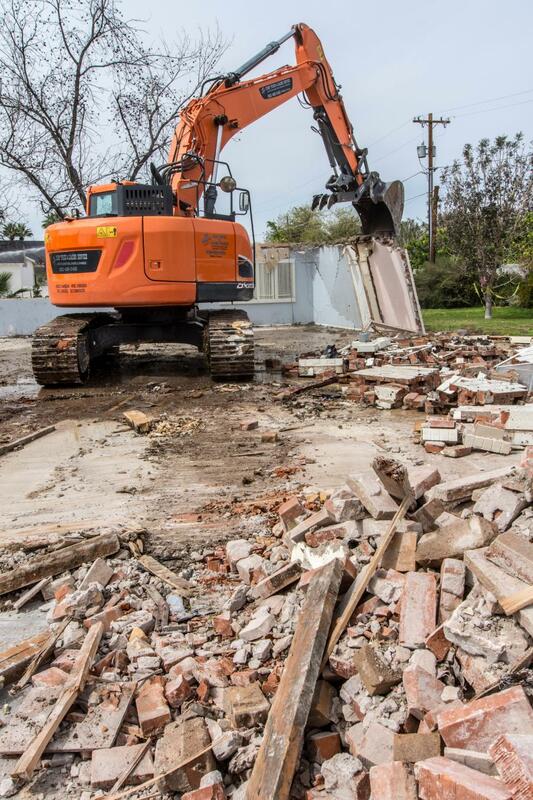 George purchased his first Doosan crawler excavator — a DX140LCR — and was pleased with the reduced-tail-swing machine's performance and its size, which fit nicely on his residential demolition job sites. The 113-net-horsepower excavator weighs approximately 15 tons, and its shorter tail-swing profile helps customers working in tight spaces. Not long after he purchased his first Doosan excavator, George purchased a Doosan wheel loader, then a second Doosan excavator, a DX235LCR. He chose to step up from the DX140LCR to the larger DX225LC-3 size for more power (166 hp) and reach (31 ft., 10 in.). 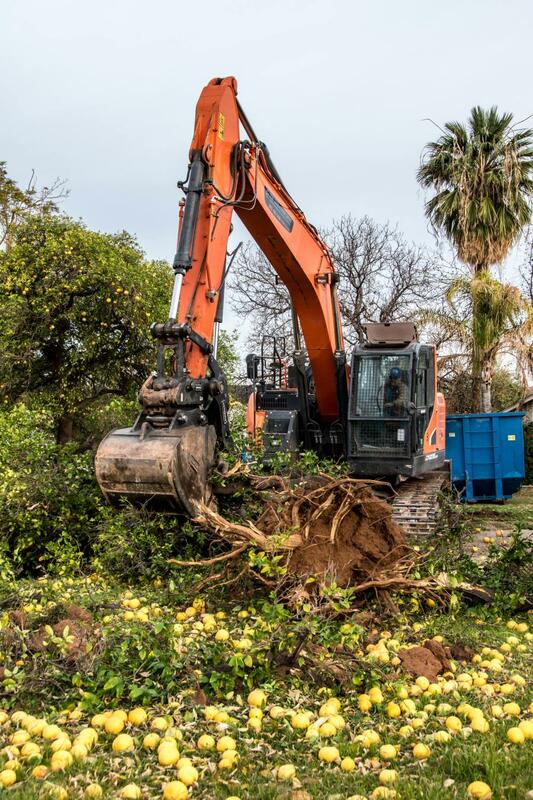 The larger excavators have no problem demolishing swimming pools as they work alongside home demolition projects. Operators demolish homes and commercial buildings using the excavators with buckets and clamps. They grab onto debris, lift it and empty it into a roll-off container. If the property has trees, they're taken down and placed into a container that goes to a local firewood company. Then the crew separates the trash from the bricks and blocks. The trash goes to a transfer facility. Once trash is removed, the operator uses the excavator to take the walls down on top of the concrete slabs. The brick goes into a container where it is transported to a landfill for disposal. Concrete, the last step, is broken and loaded into containers to be transported to a local recycling facility. “The excavator's reach is nice, because sometimes it can be tough to load my dumpster trucks, but now with the reach, the machine makes it easier,” he said. 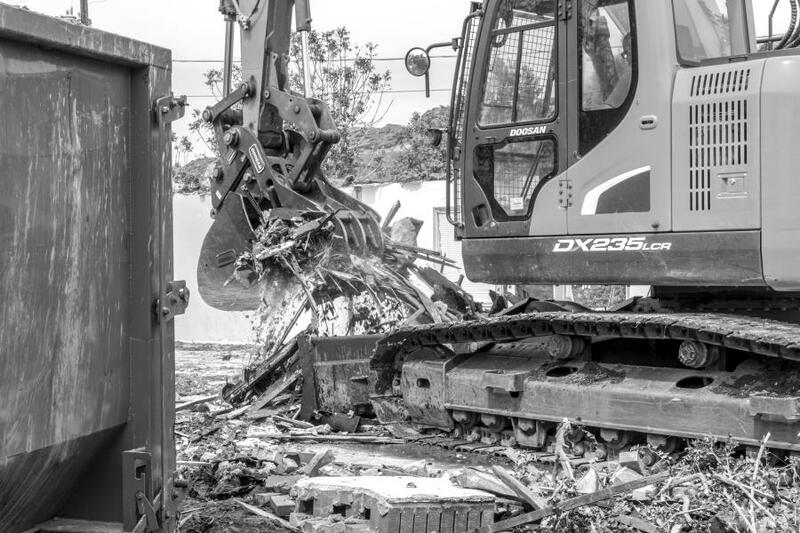 “Demolition is tough on machines, and we're so busy, I can't afford for them to be down. After George's crew demolishes a home, they almost always go back and build a certified house pad. An employee operates the Doosan DL250-5 wheel loader with a bucket to spread the fresh dirt. Employee Brian Richardson likes the Doosan wheel loader so much that he put his name on it. “He's the best wheel loader operator that I've ever seen,” George says. George has built a loyal following from his nine employees, including his 75-year-old father, who are instrumental in the company's ongoing success. The following individuals work for George: Brian Richardson, David Richardson, Ken Taelman, Tom Cravens, Bubba George, Justin Sayer, Tony Smith, Jason Theodore, Luke Swihart and Pam Wright. Business is so good today that George doesn't need those newspaper ads from his younger days. He has embraced a new means of sharing his story and what his equipment can do — Facebook. 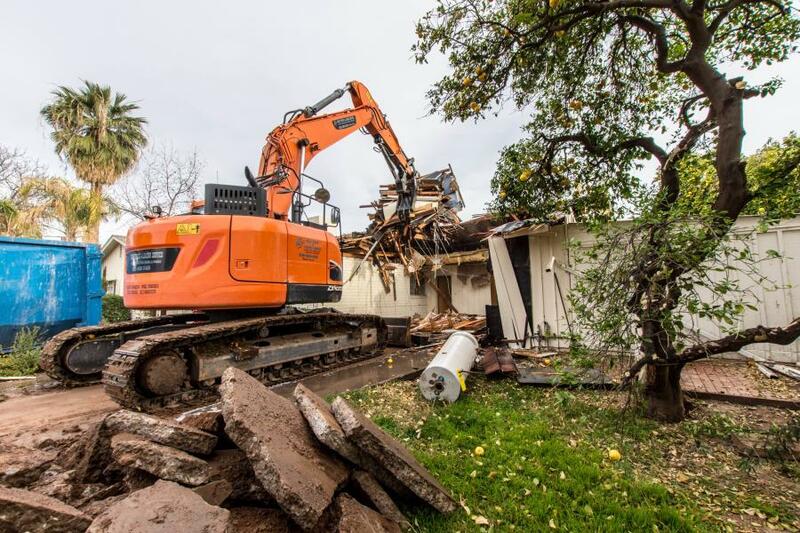 His page features photos and videos, including his Doosan equipment, doing what it does best — demolishing homes and grading lots.